Just as the Mac became the predominant music-crafting tool in the 1980s, the iPad is quickly assuming this role in this decade. The tactile display coupled with powerful hardware make it an ideal surface to construct digital musical landscapes. While eager budding musicians can begin their explorations with Apple's Garage Band, experienced music architects will need a program that allows the full realization of sampling, sequencing, and looping possibilities. This is the space that iOS developer Retronyms hopes to fill with its embodiment of Akai Professional's MPC dedicated music hardware within a software equivalent called iMPC Pro 2 ($24.990. Is the app worth its relatively expensive (in comparison to other tap-centric music construction apps in the App Store) price? Read on to find out. For those unfamiliar with Akai Professional's line of MPC hardware, these boxes provide a 4x4 grid of push pads used to capture, edit and arrange audio samples into musical beats, loops, and melodies. Retronyms has translated a number of the capabilities in dedicated MPC devices for use on the iPad. 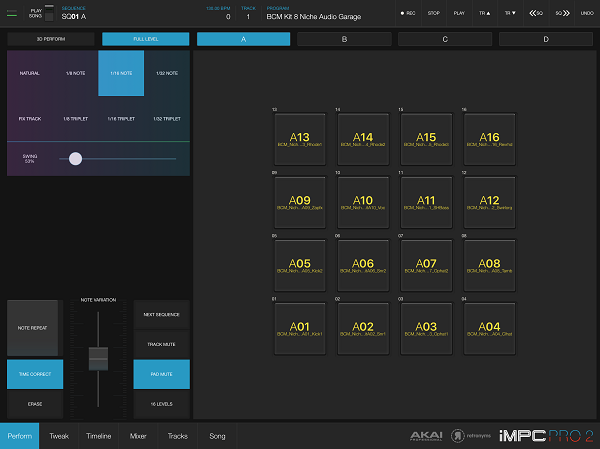 iMPC Pro 2 retains most of the look and feel of Akai's efforts while spreading out the features across multiple screens to prevent clutter and to highlight the tap grid used throughout the application's functions. Musicians already familiar with Akai's MPC X will feel right at home and immediately productive using iMPC Pro 2. Those who have not done much composing with such a device or are new to the beat-centric looping sequencers in general may initially feel slightly overwhelmed. Fortunately, the developers included an innovative 10-step tutorial system known as iMPC University that helps newcomers learn the program's complexities. University graduates are rewarded with an exclusive free Sound Pack called "The Diploma" to help encourage both newbies and veterans alike to complete the course. There is also online documentation available, but it is rather sparse and even incomplete in some sections. However, like most iPad apps, many of the UI elements are more or less self-descriptive and can be quickly comprehended after experimenting with the actions and/or effects they apply to the music data. iMPC Pro 2's feature set is fairly extensive. 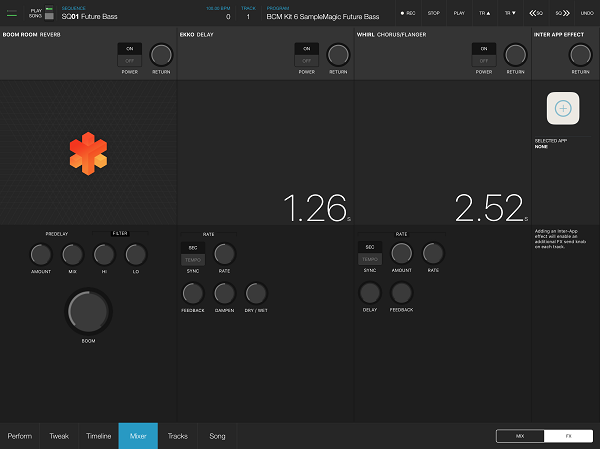 In addition to the basic controls one would expect an audio sampler, sequencer, editor, and looper to include, the app also sports a 64 track mixer with the usual chorus/flange, delay ,and reverb audio effects, quantization with swing, 24 scale modes (including aeolian, blues and chromatic), and more. The app also supports MIDI, IAA, and Ableton Link hardware support that elevate an iPad running iMPC Pro 2 the true brains of the live or studio musical performance. Samples can be imported numerous ways, from external mics and hardware audio interfaces, to the iPad's built-in mic, royalty-free audio clips downloaded from the Internet, commercial wave bundles via Sound Packs and even samples from Spotify. While any sampling rate in these files is supported (the developers have stated that the app supports up to 96 kHz with up to 32 bits), the sampler render and output is constrained to 44.1 KHz at 16 bits due to the limitations of the iPad's hardware. Once the samples have been imported and individually tracked (the app supports up to 768 simultaneous voices, though it's unlikely that such a cacophony of streams will achieve such a limit), they can be selected, mapped, and manipulated via the tap grid and other UI elements available on the various control screens the app provides. About the only mildly annoying limitation that the developers might consider resolving in the future is the fact that iMPC Pro 2 is currently not a universal app, thereby limiting it strictly to iPad-only status. Given the larger screen of the iPhone X coupled with the fact that Retronym's other iOS apps are universal, it would be a natural progression of the program to support both iOS platforms. Moreover, if/when Apple opens up its API for the iPhone X's front facing sensor array, it would be cool to translate facial expressions, jaw movements, and the like to real-time playback effects. In the meantime, an older, dedicated iMPC for iPhone provides an inexpensive alternative. Thanks to the grid tap nature of beat production, using the app is straightforward and simple. 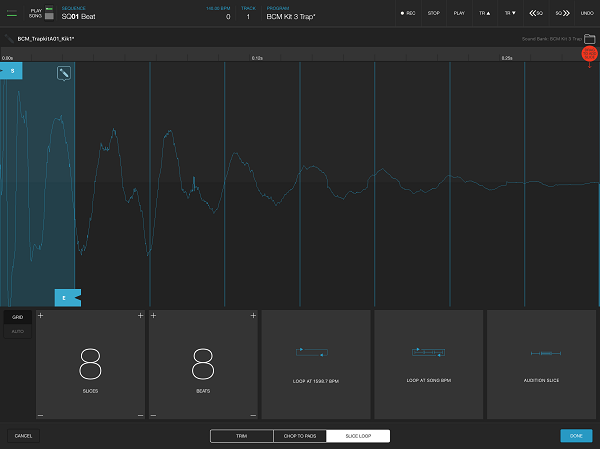 Assigning sounds, tracks, and events with the grid is painless as are the audio effects and mixer controls. Those who have used such beats-driven loopers and sequencers will be up and running in minutes. Newcomers will need quite a bit more time to explore and understand the composition process using such a expansive and flexible musical canvas. Thankfully, Retronyms has included several demo projects that can be imported and manipulated (changes will be saved to your own project, leaving the source demos intact) and are a fun and engaging way to experiment and learn the variety of options available in iMPC Pro 2. Both new and seasoned beat composers will discover that iMPC Pro 2 has nearly everything dedicated and much more expensive Akai Professional hardware alternatives have to offer.